We really enjoyed the Wonderbrass at our staff and customer Christmas party this year. Their fantastic big band sound and broad repertoire with groovy tunes for everyone's tastes throughoutthe night, confirmed a good decision had been made to book them in for our event. Wonderbrass are a collection of 9 of Sydney's finest singers and musicians all working towards one goal: creating the perfect party atmosphere through live music! Building on over 10 years of experience as a band in the live performing arena, Wonderbrass are quickly becoming recognised as one of the most exciting, fun and professional bands in Australia and throughout the Asia-Pacific region. 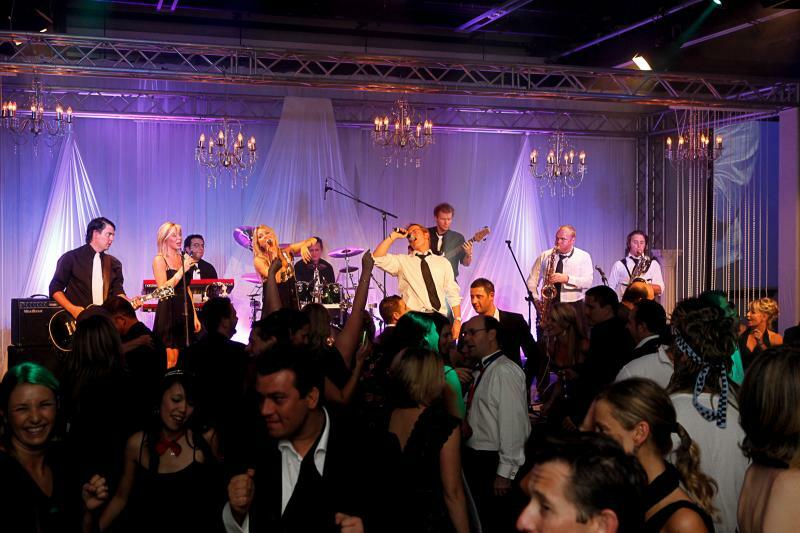 Having performed for some of Australia's largest corporate companies, not to mention celebrities in the last year alone, it's not hard to see why the band are now shining as the only choice for many of Australia's leading event management companies. Wonderbrass performs everything live, whilst interacting with and engaging their audience, to deliver an exciting show un-parralelled in live entertainment! Whisper Your Name - Harry Connick Jr. I recently had the opportunity to work with The Wonderbrass during the recording of their new demo cd. As the General Manager of the most prestigious recording studio in the country, I work with some amazing talent on a regular basis. I was particularly impressed with their level of professionalism as well as their incredible musical ability. The brass section is awesome and the two gorgeous female vocalists have voices like angels. Above all, they are lots of fun and extremely versatile. We are happy to offer them as our preferred covers band for events we hold regularly at out facility.